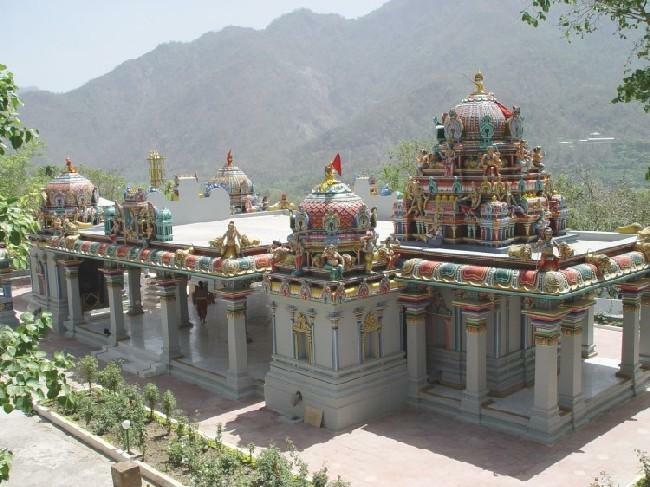 By the Grace of the Divine Mother, Omkarananda-Kamakshi-Devi Mandir, as envisioned by Gurudev Paramahamsa Omkarananda Saraswati, was completed in the year 2004 at Omkarananda Ashram Himalayas in Muni-ki-reti, Rishikesh, India. This project was started on 23rd April 2002 with Bhumi Puja, by the grace and blessing of Gurudev Paramahamsa Omkarananda Saraswati, and under the able guidance of Shri Kamakoti Shastriji, Chief Priest of Kamakshi Mandir, Kancheepuram, Tamil Nadu. The temple was meticulously planned and executed according to South Indian tradition and Vastu Shastra by the renowned Sthapati Shri S. Ravichandran of Kancheepuram with the help and labour of South Indian masons and artisans. The temple is located on a sacrosanct land inside the Omkarananda Ashram complex at the foothills of the Himalayas, where Gurudev had done his intensive Tapasya and Shrividya-Sadhana in the 1950s and 1960s and where many times extraordinary Yajnas had been conducted. On 20th March 2000, a team of nineteen devoted and learned South Indian Priests came to the Omkarananda Ashram Himalayas on a special invitation, and conducted a grand Rudra-Yajna at the proposed temple-site under the expert guidance of Pandit Sudhakar Sharma and Shri Kamakoti Shastri. This elaborate Yajna was conducted for ten days upo 30th March 2000. During these ten days, the priests also performed Rudra-Abhisheka with a newly installed Sivalinga, as well as Shrividya Puja daily. Many devotees from India and abroad had attended this unique Maha-Yajna and vividly felt the presence, blessings, strength, inspiration and the Grace of Gurudev Paramahamsa Omkarananda Saraswati. Thus, long before the Bhumi-Pooja of the proposed site for the construction of the ‘Omkarananda-Kamakshi-Devi Mandir’, the land had already been dedicated to the Divine and charged with divine vibrations – not only through this grand Rudra-Mahayajna, but also through the Chandi-Mahayajna conducted in 1999, and other powerful Havanas performed during the religious festivals like Navaratri, Omkarananda Jayanti, etc. in the earlier years. The newly built temple complex consists of five temples, a Navagraha temple, a Mandapa and a Yajnashala. Besides the main temple of Shri Omkarananda-Kamakshi-Devi, there are two smaller temples of Shri Meenakshi-Devi and Shri Chamundi-Devi to the left and right side of Mother Omkarananda-Kamakshi. On the opposite side, facing these three Devi Mandirs, there is a temple of Lord Venkateshwara and Padmavati-Devi and the Gurudev Paramahamsa Omkarananda Saraswati Mandir. On the North side, there is the Navagraha Temple, and on the East side the Yajnashala.